So when I walked into the living room today (after Marco had already left for work) I spied something on the couch from across the room. It turned out to be an extra large Valentine’s Day card, complete with a bit of Dutch for me to translate. It’s actually a lollipop from Sumo, a restaurant in The Hague which we visited in late December. 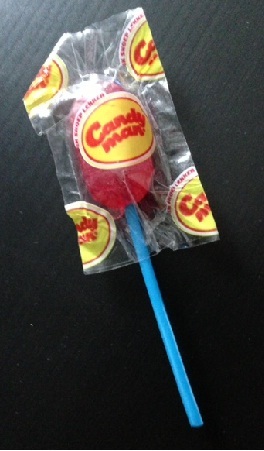 It is a running joke that I like the lollipops from that restaurant (which you receive on your way out) because one of them that I got was a four colored lollipop which I found amusing. Considering it has been a month and a half since we visited there, he has held on to it for a long time! He only brought it out long enough to tease me with. On a more serious romantic note, he also slyly told me last night that he made reservations for the two of us at Rodizio tomorrow night. Grilled pineapple – yum! But first — tonight Marco, Roger and I are heading to the Boederij in Zoetemeer to see the band BRAD, which is the second band of one of the Pearl Jam members. Should be fun!